Trevor Wadleigh and Chris Marchant were eliminated from The Amazing Race during the sixth episode of the CBS reality competition's 30th season. 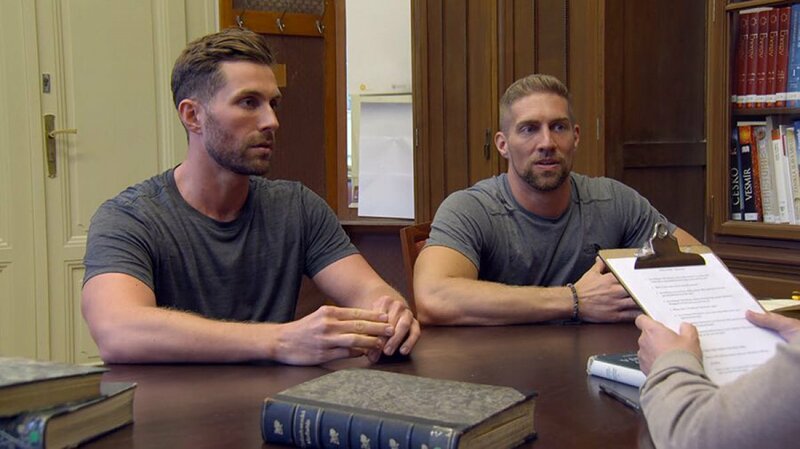 During a recent exclusive interview with Reality TV World, Trevor and Chris talked about their The Amazing Race experience and elimination. Below is the concluding portion of what they had to say. Reality TV World: When you got U-Turned, you guys seemed to perform in tasks better than ever before. Jessica mentioned at one point the U-Turn might've lit a fire under you. Is that accurate to say? Trevor Wadleigh: Definitely. I don't think we had any less -- we tried just as hard, if not harder, to keep going and make up any time we could, because we knew we had to. So if there's a chance of staying in it, we're going to have to work harder and kill it. Reality TV World: Do you almost wish you were under a similar type of pressure in previous legs to get that extra push? Trevor Wadleigh: We gave every leg our all. I think our downfall in former legs -- and a lot of times, you can't really get this perspective, because it's just spent in a car sitting a lot -- that's why we didn't finish earlier or higher in former legs. Pressure wasn't ever really a factor. Chris Marchant: Yeah, I'd say we definitely hurried because we knew we had more to do, but I don't think we tried any more or less based on being U-Turned. I think we gave every leg 100 percent. Reality TV World: You said in your final words you'd rather get eliminated from the Race because of a U-Turn rather than a mistake you made. Could you elaborate on that? Because one might argue the U-Turn prevented you guys from living up to your full potential in the Race. Chris Marchant: You make a good point. Yeah, I mean, ideally, if I could change the past, I would un U-Turn us, but if we had to go, that's how I'd rather go, because otherwise, I'd end up blaming myself for little mistakes after the fact. And then I can make a little more peace with it knowing that it was out of my hands. I did everything I could. Reality TV World: What was the most challenging part of the Race for you two, and did anything surprise you in terms of the Race itself or your performance? Chris Marchant: I already decided that if they ask us to come back for All-Stars, I'm going to make Trevor take me to a random spot in a city while we're on tour and take my phone and tell me to find my way back to the hotel. Reality TV World: Which team did you view as your biggest competition while racing? And at the time you left the Race, whom were you rooting for to win? Trevor Wadleigh: From about Leg 2, we were really impressed with Team Extreme, the pink team, or the skiers [Kristi Leskinen and Jen Hudak]. They were always really honest, and not only were they scoring really high, but we just knew their background and that they're very competitive. They've obviously taken themselves very far in their career and weren't afraid of danger. Though they have to be intense enough to do that well in that career, they're also very calm and collected when they need to be, and they work well together. Also, they were the only team we had not placed higher than at the mat, so that was also a factor. That's why we thought they were the team to beat. So we were definitely rooting for them. Also through the tasks, we had a ton of respect for the firefighters [Eric Guiffreda and Daniel Guiffreda]. They're just the most earnest, sweet guys who don't have a bad bone in their bodies. They were totally -- I just can't even describe how kind and awesome they are. I think everybody would be so happy to see them come out in victory. Reality TV World: Did you two go into The Amazing Race with a strategy for Roadblocks? Did you just plan on alternating back and forth or try to designate one person for certain jobs based on your strengths and weaknesses? Trevor Wadleigh: We basically went back and forth, because I forget how many clues on this season they've read verbatim to the audience, but [the clue] is really, really vague, and usually if you assume something about one of the Roadblocks, then you're wrong. So we tried to guess what the task was going to be before you pick who does it, but it's really hard. So we basically just went back and forth, except for one time when I thought it might be dancing, and Chris is better at choreography than I am. So I thought he should do that. Chris Marchant: It was funny because I felt like the more thought we put into who should do which Roadblock, the more wrong we were about what it was going to be and we likely would've picked the other person had we known more about it. Like the one we thought was dancing was directional... and I definitely would've let Trevor take the reins on that. Reality TV World: You must've been bummed there was no music or singing task this season so far. There usually is! Chris Marchant: We were hoping that when we got to [the music venue] in Prague there was going to be a musical challenge waiting for us, and there are so many classical composers who have roots there. We thought the stars were going to align for us to make up some time in a music challenge and then U-Turn someone else. Reality TV World: How were you cast on The Amazing Race? How did you end up on the show this season? Chris Marchant: So, one of the casting associates reached out to me on Facebook for Season 29, and I put some thought into doing that. But that was the season when you raced with a stranger, and that didn't hold as much appeal to me. I know how well Trevor and I work together, and to me, it wasn't really worth putting the effort into casting, you know? I wanted to race with a friend and a colleague and someone I thought I could do really well with. And we'd have a good time. To read the first half of Reality TV World's exclusive The Amazing Race interview with Trevor and Chris, click here.